So, Saturday night we're relaxing back at the bug and Eric walks up to me. "Hey dude, want to go boating tomorrow?" "Um…can I?" I didn't have any of my gear with me. Furthermore, I haven't been in a boat in 20 months or so, and last I heard the Merced river was running at about 300% of average flow — nearly continuous Class III and IV rapids. "One of the folks I went with today offered to loan you all her gear so you could paddle tomorrow!" It didn't take long for me to decide. Despite the fact that I hadn't been boating in so long, I couldn't turn down an offer like this. The next morning, we got up packed our stuff and loaded up the car. I was going to be paddling a Pyranha H:3 that belonged to a woman a few inches shorter than me, so it took some work to adjust the outfitting. We ended up pushing the seat back as far as we could since the bulkhead was too big to move forward at all. That meant my weight would be shifted back in the boat, making maneuvering more difficult. Just before we said our goodbyes, I was loading the last of my gear into Eric's car. A convertible drove by and the drive called out saying that one of our tires looked really low. I looked and, sure enough, the rear drivers side tire was nearly flat. Is it a sign? Should I bail on this trip? I purged the thoughts from my mind. 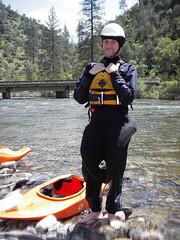 I was psyched to get on the river. Eric amazingly changed the tire (with just a manual jack and tire iron) in under 15 minutes and we were on the road. We set the shuttle and scouted a few of the bigger rapids. We spent the most time looking at Nightmare, a big class IV with a tricky left-to-right move halfway down to avoid an enormous hole on river left. Gazing at the features of the river, half of me was excited and impatient to get onto the river, while the other half was starting to seriously worry about how strong my combat roll would be after this much time off. The put in drops immediately into strong class II, so it was a half mile before I could test my roll. I tried both sides, and popped up no problem. The H:3 is a high volume river runner/creeker with a flat bottom, and was way easy to roll up. That calmed my nerves, and before I knew it we had cruised through several class III sections and were approaching nightmare. Nightmare features a rocky islet at river center, with the most navigable channel on river left. However, that channel dumps into a munchy hole, so one must catch the slackwater behind the islet and drop onto a narrow tongue of current just right of center to make it through the bottom section. I positioned myself in the middle of our pack, so I'd be surrounded by boaters if something went wrong. But nothing went wrong. A lot of my muscle memory was still there, and I got through Nightmare with no problem. I was psyched. Nightmare is actually the beginning of almost 2 miles of fairly continuous (at least at this flow level) Class III and IV whitewater. I made it through a couple more rapids before my first flip. It was a scary one. I was following another paddler in our group, who took the inside line through a turn. Just as I came down over a big wave, I saw that he had just narrowly missed a pourover into big hole and that I was heading right for it. I tried to sweep and crank myself right, but ended up just killing my momentum and dropping into the hole sideways. I was sidesurfed for maybe a couple seconds before I flipped. I scraped my helmet on the way down and there I was, dark, boiling water rushing about me. I gave myself a couple seconds and tried to roll up. Got about 3/4 of the way — enough to catch half a breath — and saw that I was still in the hole, then flipped back under. I tucked, set up, and waited…and waited. Time moves very slowly when you're under water. I couldn't have been in the hole more than 5-7 seconds, but it felt like 30. Finally I felt the currents around me change, and I gave rolling another shot. I popped up easily about 15 feet downriver of the hole. Whew. That episode spooked me a bit, and I wasn't as aggressive as I should've been the rest of the way through, resulting in about half a dozen more flips. But I was always able to roll up, and had a blast riding the enormous wave trains featured in some of the rapids. Our takeout was a turnout off of 140 about 7 miles downriver, right after Ned's rapid, our last Class IV. I ran it clean and Eric even shot some video (I'm the clip ending in 704). All in all this was a great run. I was very pleased with how well I did given my extended layoff and the questionable fit of the boat. I miss boating, and may find myself picking up some used gear so that I can go out with these guys again. They all belong to Gold Country Paddlers. Boof.com is also a good resource for California boating.